Sensationally detected for the first time by the LIGO instrument in 2015, gravitational waves are ripples in space-time – the continuum of the universe – that propagate outward from astrophysical systems. The question is: can we find more of these gravitational waves and do it regularly? Some years ago we have devised a method of finding far more of them, and from weaker sources, than is possible with present techniques with the help of radio telescopes and natural astrophysical masers. Gravitational waves were predicted by Einstein’s General Theory of Relativity, which describes how the universe is shaped (curved) by gravitational fields. If a catastrophic event like the destruction of a star takes place, a burst of gravitational waves propagates outwards at the speed of light. By the time they reach the Earth, gravitational waves have often travelled across millions of light years of space. They are then extraordinarily weak disturbances, and for more than half a century the direct detecting of gravitational waves was a challenge for physicists. Finally, the first event detected by the LIGO team required the interferometer with four-kilometer-long arms to change their length by a fraction of the size of a proton – such is the ‘displacement’ that must be registered. Despite this, LIGO is expected to detect many more events once it enters full operation in 2020. In order to escape waiting for a catastrophic event which produces such a tiny signal, a principally different idea of registering gravitational waves was proposed. A wave affects not only a macroscopic body but a free atom or molecule as well. If this perturbation is long enough and periodic, and the atoms belong to an astrophysical maser – short for “Microwave Amplification by Stimulated Emission of Radiation” – the maser signal obtains a specific ‘non-stationary’ feature whose amplitude has the same order as the signal itself and which can be detected by processing the signal of the radio telescope. In space we find natural astrophysical masers formed by clouds of various molecules located near stars. The radiation from the star stimulates the molecules, until they emit radiation at a specific frequency. This propagates through the cloud, stimulating other molecules and building up a strong source detectable by radio telescopes on Earth. 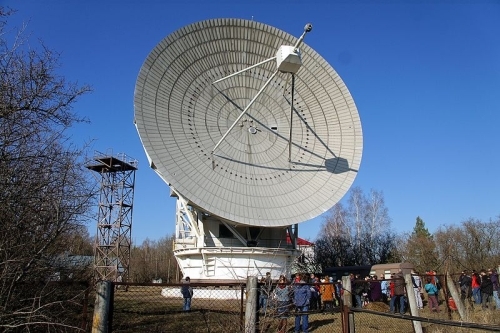 The Radio Astronomy Observatory of Russian Academy of Science in Puschino, Russia – a place where they listen to stars. CC-BY-SA-4.0 via Wikimedia Commons. Two close stars in orbit around each other in so-called binary systems are a source of weak and strictly periodic gravitational waves. It turned out that in certain circumstances the waves from such a binary system will affect the output of an astrophysical maser. The maser signal acquires the non-stationary component with the same frequency as the gravitational wave, in a direct relation to the time taken for the two stars to complete each orbit. Through our investigations, we have found more than thirty cases where masers influenced by gravitational waves from binary star systems show evidence for this effect. Unlike the dramatic events needed for a LIGO detection, radio observatories could now find continuous sources of gravitational waves. But our technique can take things further by using masers and binary stars as beacons of gravitational waves. Comparing the different systems will then give us an entirely new way of testing the properties of space-time. We now invite radio observatories around the world to test these ideas. Featured image credit: Gravitational Waves of a compact binary system by MoocSummers. CC BY-SA 4.0 via Wikimedia Commons. Sergey Siparov defended his Doctor of Sci thesis in theoretical physics at Saint Petersburg State University, Russia, and is now a professor of physics at Saint-Petersburg State University of Civil Aviation. His research areas include general relativity, gravity, and cosmology. 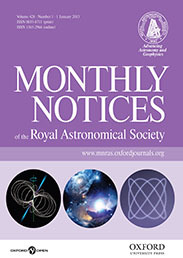 He is lead author of “Origin of observed periodic components in astrophysical masers’ spectra” recently published in Monthly Notices of the Royal Astronomical Society.